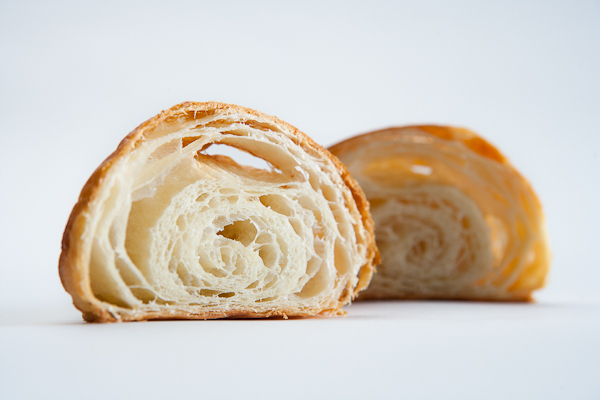 The flaky interior of a croissant. Laminated dough is any dough that has a block of butter, called a beurrage, folded into the dough, called a détrempe. Once combined, they are called a pâton and will be rolled and folded (or turned) the appropriate number of times for each type of dough. Each type of dough has the butter added in a different way and the number and type of folds will vary resulting in varying degrees of flakiness. Examples include puff pastry, croissant, Danish and kouing aman.